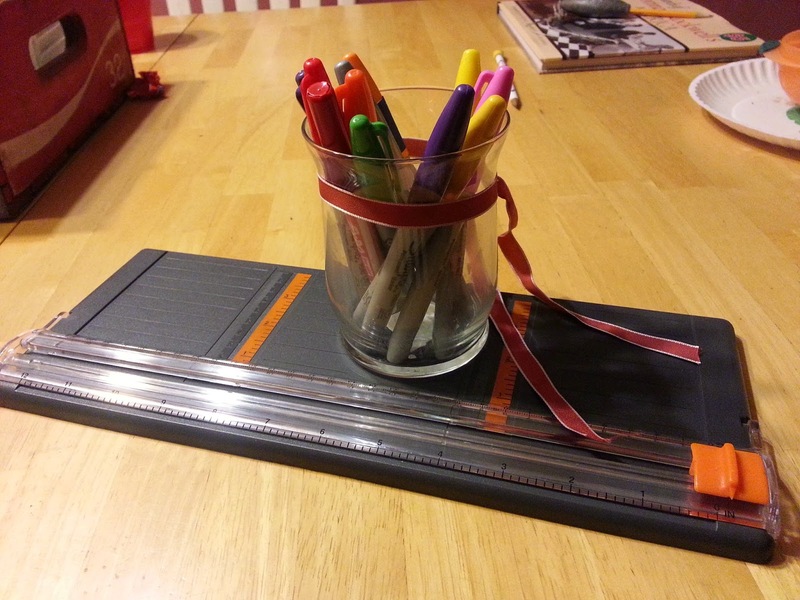 When I decided to have a “home school” page on my blog, I didn’t want to “follow” a certain curriculum or method, or be a second Pinterest page to look at. Instead, I want to encourage home-schoolers in their journey whatever they use and wherever they are. This journey is hard enough without thinking we have to be highly organized or crafty to do this well. If God called you to it, He knew You could do it with the personality and style You posses. Now, that doesn’t mean we don’t grow in the process, but we thankfully don’t change who we are! One way I have had to grow is teaching different children with their different personalities and learning styles. Just like we moms are different, I have 3 different ones in my own house. My first child is eager to learn, fast at getting concepts and works well independently. My 2nd child, however, has struggled with reading, learning her math facts, spelling words and honestly school in general. This led to a huge disconnect within our family and one teary eyed Momma! After sobbing to my husband late one evening, he helped me reconnect with my daughter by speaking her language, not mine, or my son’s. She learns by hearing it over and over and over and by touching it or moving with it. I thought this was really difficult, but have found some small, simple and cheap activities that are fun and easy to incorporate. This has helped me unlock my daughters brain SO much, that I wanted to share with others in case they were facing the same walls as I was. Not every child will benefit from this, but I hope some will! 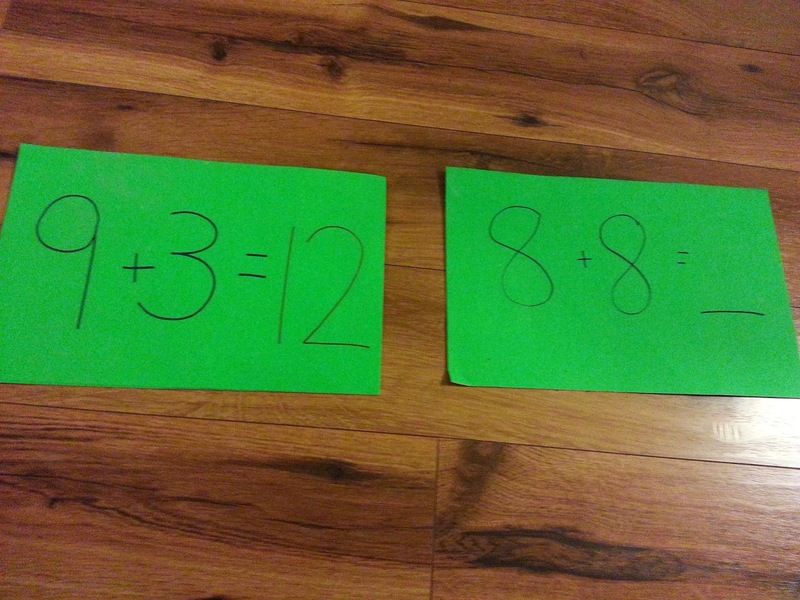 Step 2: Turn strips into Math Facts (multiplication, division, subtraction also work!) On one side I wrote the problem with the answer, and on the other, I left off the answer. That way it is easier for her to review on her own. I’ll give her a stack of 5 and she can jump on them while she says the fact out loud, or circle up her babies and teach them while they have a tea party! Then I come in flip them over one at a time where the answer isn’t showing and have her do it that way for me. 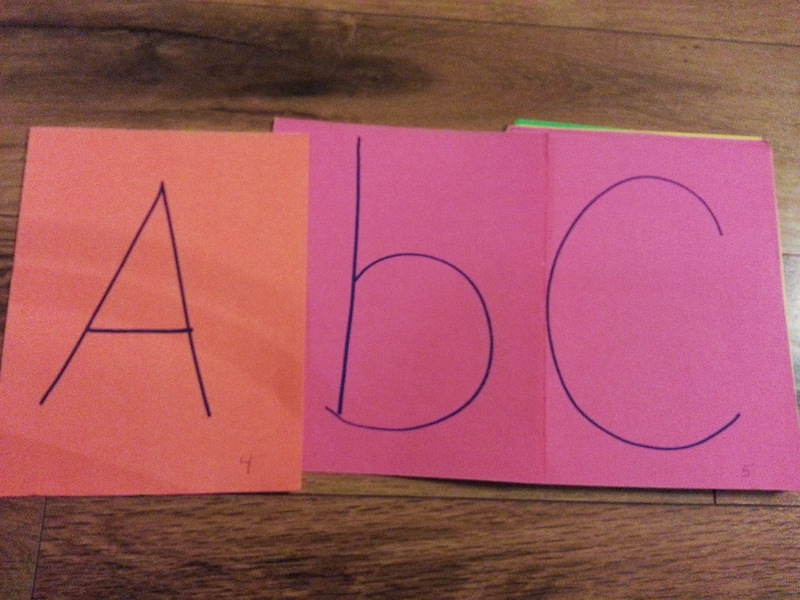 Step 3: Turn squares into a stack of alphabet letters for Sight or Spelling Words. Step 4: Have child repeat over and over while putting movement to his/her words. For example, I give my daughter the word “place”. 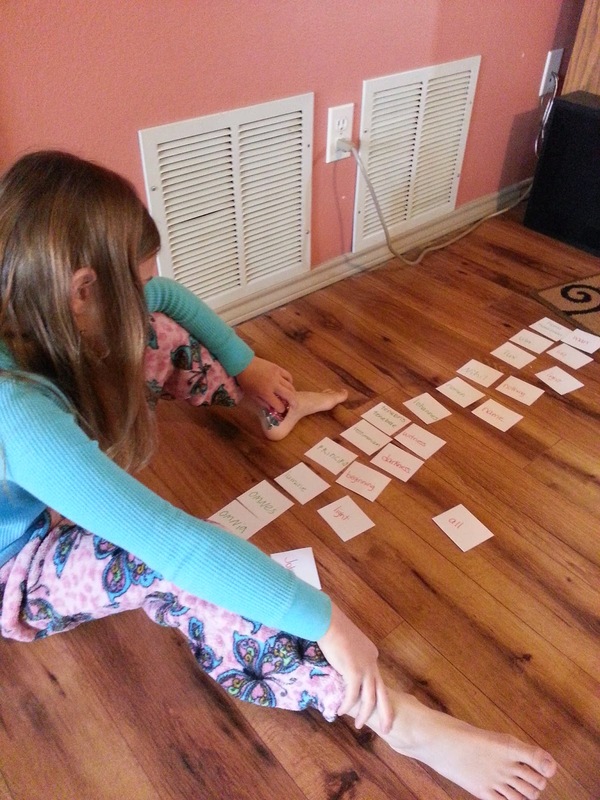 She looks at the word and finds the letters from the stack. 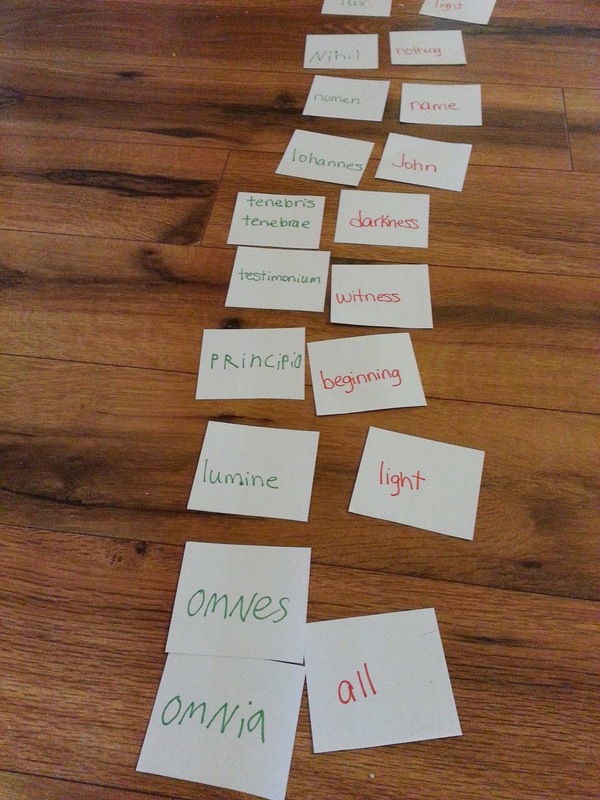 Then she lays the cards underneath the word and I told her to take a picture of it when she finished. 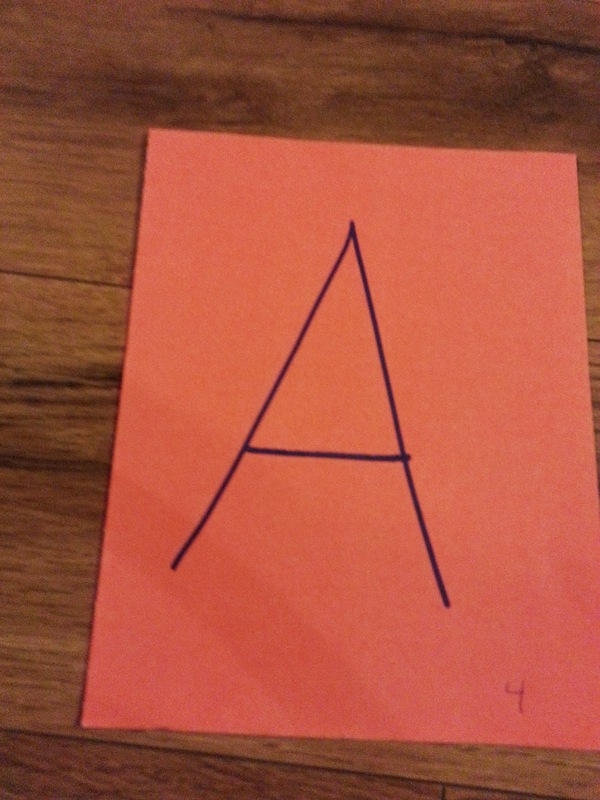 For ABC order emphasis, when she’s finished, I tell her to place the letters BACK in order! 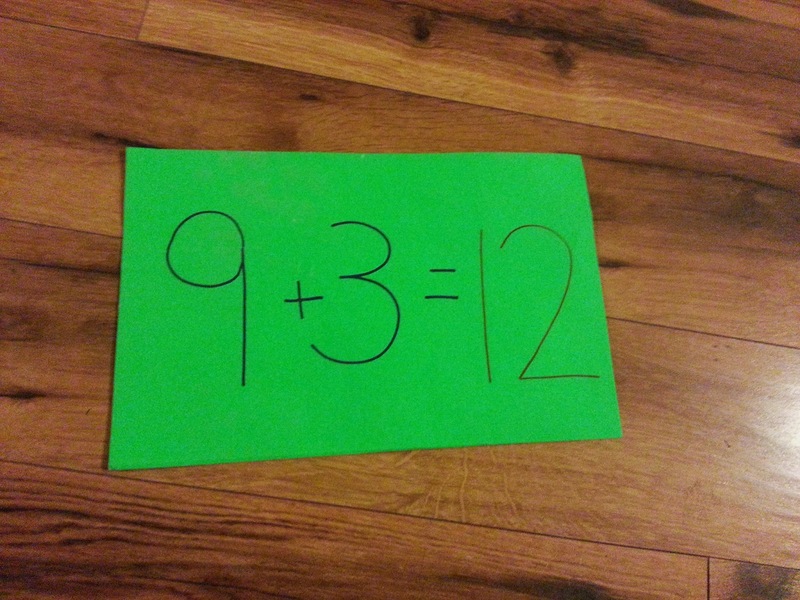 For extra math emphasis, I wrote a small number on the bottom corner of the letters and she has to “add up” each word. 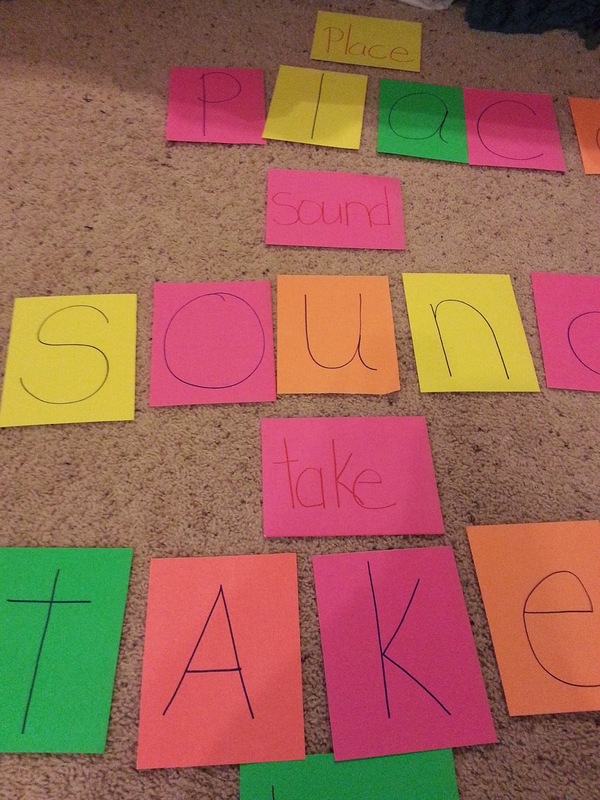 For spelling practice, you could scramble up the letters and have your child spell it correctly. I’m sure there’s many more activities you can think of, I just hope to start you thinking. We participate in Classical Conversations (CC). This year our cycle is American History, which includes memorizing the states and capitals & their location. 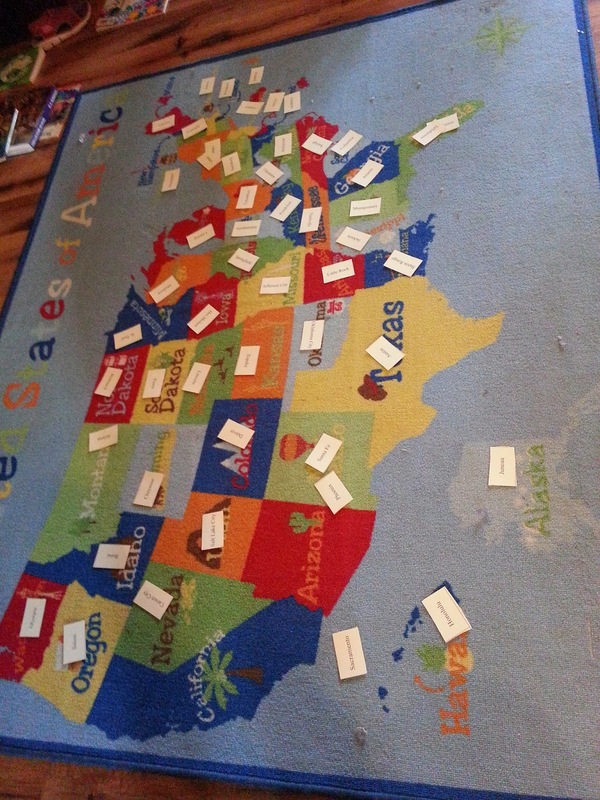 The idea of putting movement with my daughter’s school gave me the idea to print out the capitals and have her place them on the state map mat which is in our living room. Here’s what it looked like. She wanted to do this TWICE, without whining!! 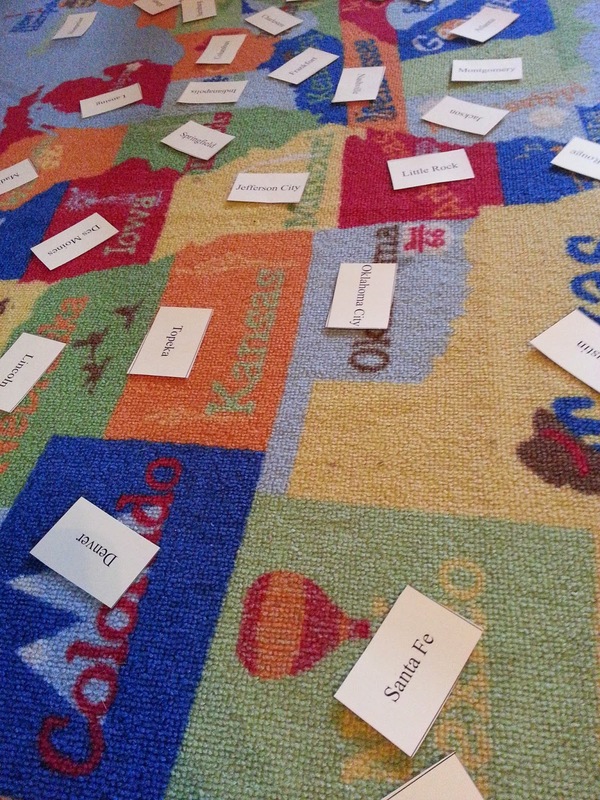 I got this rug at Target or you just search Amazon for educational rugs. 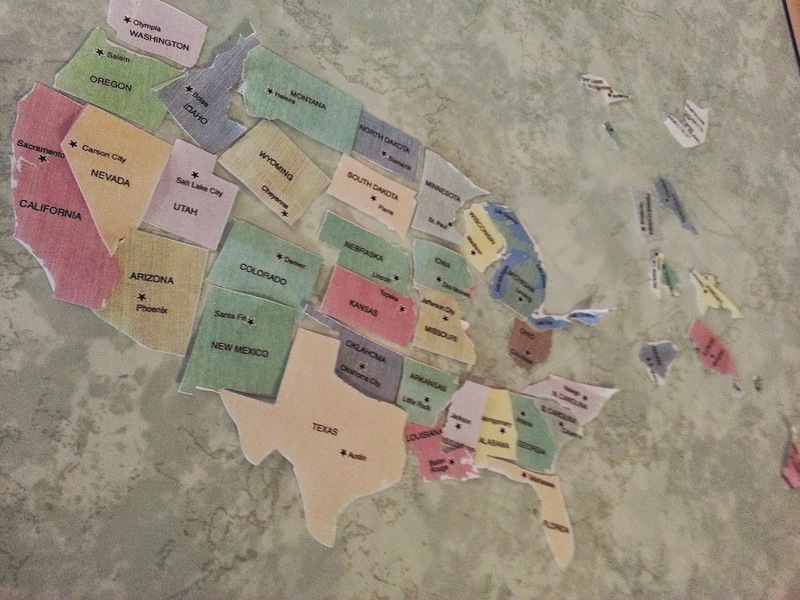 Or if you don’t have/want a rug, you could print out a map of the US from the internet and do it on a smaller scale! Another thing we are doing at CC this year is learning Latin vocabulary words and conjugating English infinitives like “to lay/to raise, etc. 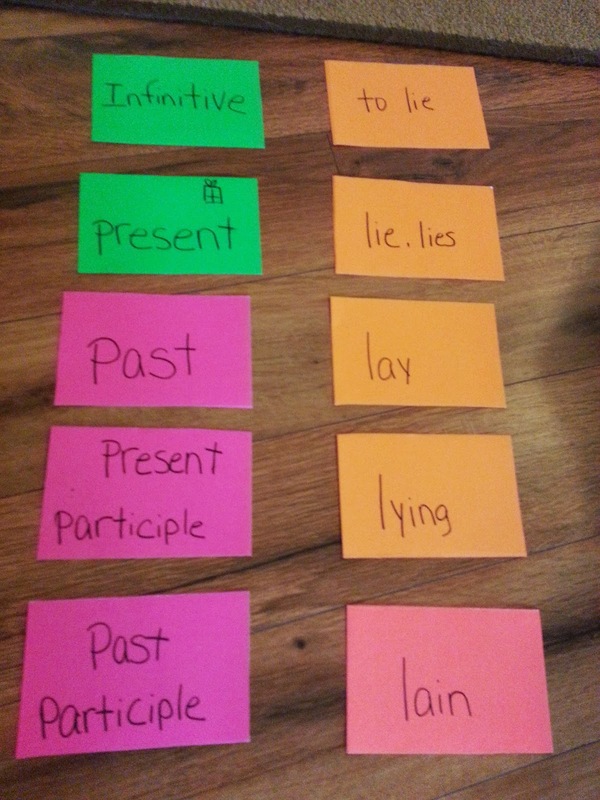 Incorporating the same simple note- card method, I put the English words in one color and Latin in another, mixed them up and had the kids match up the corresponding words. Here’s what that looked like. Maybe you aren’t doing Latin…this could just as easily be done with Spanish, French, Swahili, anything with vocab or matching! Again, I hope to give you tools to use anywhere/anyhow YOU can where you are in your journey. 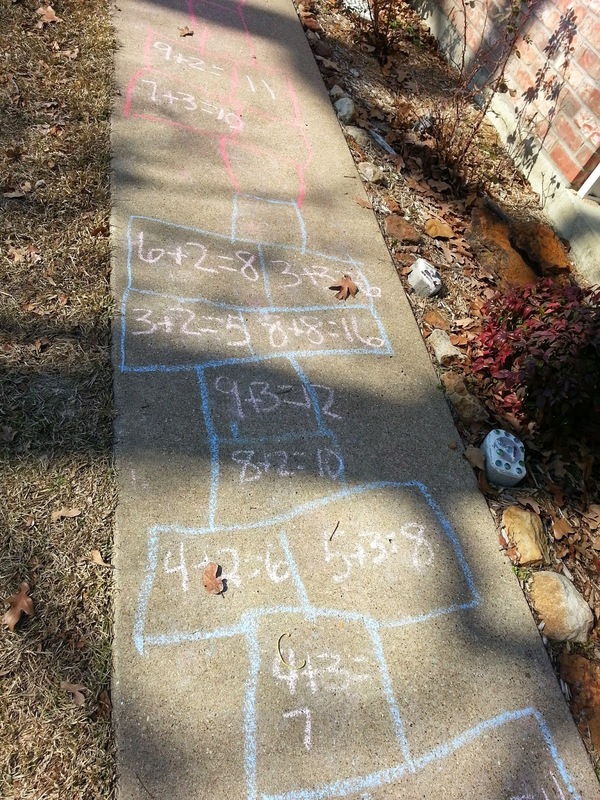 More fun-moving ideas…move the math outside and turn it into a hop scotch! We also found it was easier to place our math cards we made just on the double tiles instead of writing them on each one. 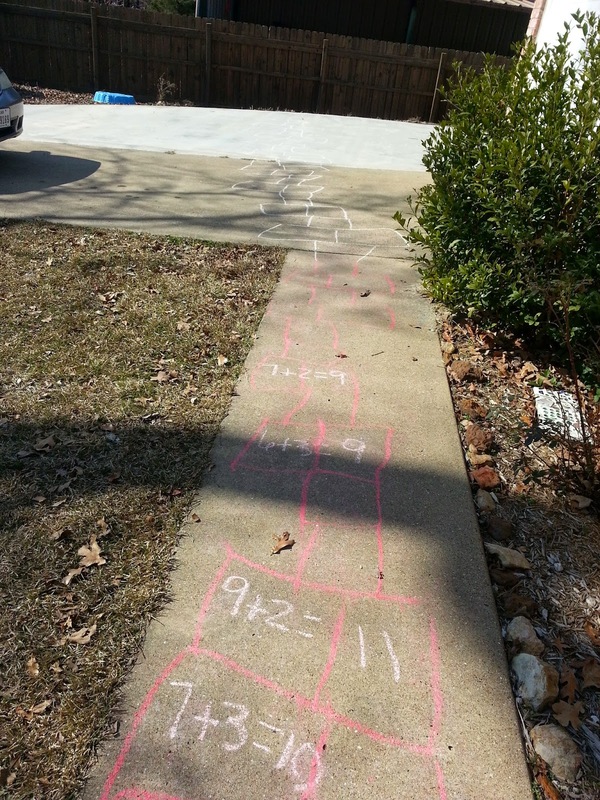 Mackenzie drew this hop-scotch all the way to the white concrete! One of the goals of homeschooling is to unlock our children’s brains to learn. To do that, we must learn how they learn. We must learn how to speak their language. Imagine me trying to teach you how to cook while speaking in Spanish. Yes, you would see what I did, but wouldn’t understand a word I said (except maybe Si!). The same is true when we insist on our child to learn by one method, when their brain does not process that way! We might as well be speaking Spanish to them. I encourage you to spend the time to understand your child and watch how the door is unlocked before you and them!! !